17/04/14 -- Soycomplex: Beans closed a little lower on light profit-taking ahead of the long weekend. They still managed decent gains for the week though. Fresh news was lacking heading into the Easter break. Weekly export sales for beans came in at a net 19,200 MT for old crop (with the trade expecting zero due to tightness in availability) and 400,700 MT for new crop (expecting 150-350 TMT) - the latter being mostly for unknown/China. Actual shipments themselves this week were 339,200 MT, continuing to slacken off - as they need to do. The US has now already shipped 41.5 MMT of soybeans abroad this year, and has outstanding sales of just over 3 MMT. The USDA estimate for the season is only 43 MMT, so the US has already exported 96.5% of the USDA target for the season, and has total commitments of 103.5%. Whilst talk of China now defaulting on as many as 30-40 cargoes of existing soybean purchases is bearish, outstanding sales from the US are only said to be 141,400 MT - so this is a much bigger problem for South America than it is for the US. The Argentine soybean crop is 21.4% harvested versus 38% a year ago. The Ministry there estimate production this year matching the 2009/10 record at 54.5 MMT, and up 12.4% versus 48.5 MMT last year. They say that Argentine growers have around 20% of their crop sold versus 25% this time a year ago. May 14 Soybeans closed at $15.14, down 4 3/4 cents; Jul 14 Soybeans closed at $15.02 1/4, down 6 1/2 cents; May 14 Soybean Meal closed at $488.30, down $2.70; May 14 Soybean Oil closed at 43.41, down 30 points. For the holiday-shortened week that puts nearby beans up 51 cents, with meal up $15.40 and oil 131 points higher. Corn: The market also closed with modest losses of around 2-3 cents in light consolidation ahead of the Easter break. Weekly export sales came in at a combined 794,500 MT (including 192,600 MT of new crop), in line with the expected 600-900 TMT. In addition, the USDA announced 125,000 MT of corn sold to South Korea for 2013/14 shipment. Exports this week were 1,111,000 MT. MDA CropCast cut their forecast for Ukraine corn production this year by 1.1 MMT from last week to 27.1 MMT, a 10% fall on last year's record, although still easily their second largest crop ever (their previous best was 22.8 MMT in 2009/10). MDA CropCast also trimmed their view on Argentina's output next year by 1.5 MMT to 22.7 MMT. Strategie Grains estimated the EU-28 2014/15 corn crop at 65.1 MMT versus a previous estimate of 65.2 MMT and 64.1 MMT in 2013/14. The Argentine corn harvest is said to be 19.7% complete versus 31.7% a year ago. The Argentine Ministry estimated the 2013/14 corn crop at 23.5 MMT versus 27.0 MMT last year. They said that Argentine growers have sold 25% of their 2013/14 corn crop versus 57% a year ago. The US weather is finally about to improve, to the benefit of corn and soybean plantings. "The weather pattern in North America is expected to undergo a fundamental shift , finally warming up and turning significantly wetter. The biggest change would occur in the heartland, the Great Plains and western Midwest, where very strong warming is predicted along with generous rainfall. Spring weather conditions for many weeks have been cold and dry, so this represents a significant change for the better," said Martell Crop Projections. May 14 Corn closed at $4.94 3/4, down 2 3/4 cents; Jul 14 Corn closed at $5.00 1/2, down 3 cents. For the week that puts front month corn 3 3/4 cents lower. Wheat: The market closed with modest gains across the three exchanges. Weekly export sales came in at 438,000 MT of old crop and 359,900 MT of new crop. That was towards the top end of trade expectations which had been as low as only 250 TMT to as high as 850 TMT on a combined marketing year basis. The old crop sales included increases for Brazil (85,000 MT, including 50,000 MT switched from unknown destinations). MDA CropCast said that Brazil's 2014/15 wheat crop would rise 29% to 7.1 MMT, on increased plantings. They also raised their forecast for Argentina's 2014/15 wheat output, up from 10.9 MMT last week to 11.9 MMT this week, and 17% higher than a year ago. The potential for both Brazil and Argentina to produce more wheat in 2014/15 is a significant one as US exports have received a major shot in the arm from demand from Brazil this season. Strategie Grains estimated the EU-28 soft wheat crop at 137.2 MMT, down 0.5 MMT from last month but still 2% higher year-on-year. They see exports in 2013/14 at a record 26.8 MMT, with those in 2014/15 falling to 22.4 MMT, both estimates are higher than a month ago. Seeing as wheat has been possibly the main beneficiary of the sudden upsurge in speculative interest that we've seen in the markets in the past couple of months, it will be interesting to see how it takes the news that broke late in the day of a "deal" of sorts between Russia, Ukraine and EU/US negotiators reached in multi-party talks in Geneva (if indeed it holds until Monday or even proves effective at all). May 14 CBOT Wheat closed at $6.91 1/4, up 3 1/4 cents; May 14 KCBT Wheat closed at $7.58, up 3 1/2 cents; May 14 MGEX Wheat closed at $7.32 3/4, up 6 1/4 cents. For the week that puts Chicago wheat up 31 cents, with Kansas gaining 38 1/2 cents and Minneapolis adding 31 cents. 17/04/14 -- EU grains finished a holiday shortened week mixed. There may have been an element of profit-taking to today's trade, after Paris wheat hit 11-month highs earlier in the week, ahead of a 4-day weekend. Who knows what might have happened in Ukraine by the time European markets re-open on Tuesday morning? Russia's President Putin said that he has a right to send troops into Ukraine, but that he hopes that he does not have to use that right. He's not a man noted for his patience, warning the Ukrainian authorities of "the abyss they're heading into" on Russian TV, after three pro-Russian separatists were killed and a further 13 wounded in fighting in Eastern Ukraine overnight. May 14 London wheat closed GBP0.10/tonne lower at GBP170.15/tonne, and with new crop Nov 14 London wheat up GBP1.65/tonne at GBP161.50/tonne. May 14 Paris wheat closed EUR1.00/tonne weaker at EUR217.50/tonne, Jun 14 Paris corn was down EUR1.50/tonne at EUR188.00/tonne and May 14 Paris rapeseed fell EUR0.25/tonne to EUR423.75/tonne. For the week, that puts May 14 London wheat GBP3.15/tonne higher, and with new crop Nov 14 up GBP6.25/tonne. Paris May 14 wheat ended the week EUR7.75/tonne higher than it began it, with Jun 14 corn up EUR1.00/tonne and May 14 rapeseed EUR6.75/tonne firmer. Strategie Grains increased their forecast for EU-28 soft wheat exports this season by 1.2 MMT to a record 26.8 MMT - Brussels confirmed yesterday that they'd already granted 24.3 MMT worth of soft wheat export licences so far this season. With ten weeks of the 2013/14 season remaining, this estimate means soft wheat exports only need to average 250 TMT/week between now and the end of June, which looks easily achievable. The French analyst also raised their 2014/15 EU-28 soft wheat export estimate by 0.5 MMT to 22.9 MMT. On the production side of things, Strategie Grains trimmed 0.5 MMT off its 2014/15 EU-28 soft wheat crop estimate to 137.2 MMT, although that is still 2 MMT more, or 1.5%, than a year ago. The cut was largely due to higher than expected winter losses in Lithuania, they said. The current 2013/14 season's soft wheat ending stocks are seen similar to year ago levels, they added. They also forecast the EU-28 corn crop at 65.1 MMT, down 100 TMT from last month, but 1% higher than last year. Ukraine new crop corn is attractively priced, which could put European corn prices under downward pressure later in the year, they suggested. 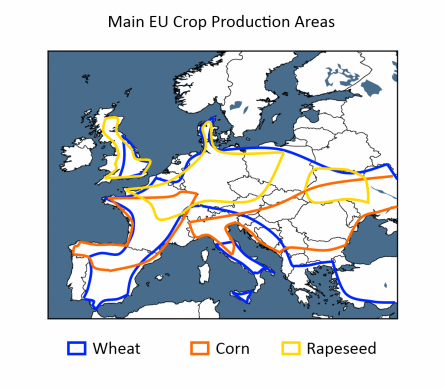 Their EU-28 barley production estimate was raised 0.5 MMT from last month to 55.9 MMT, although that's still a 6% decline on last year's crop which was boosted by unusually high spring barley plantings. This month's increase was partly due to a higher barley acreage estimate in Lithuania following failed winter wheat, they said. Toepfer forecast the 2014/15 German wheat crop at 23.95 MMT, down 3.7% versus 24.87 MMT last year. 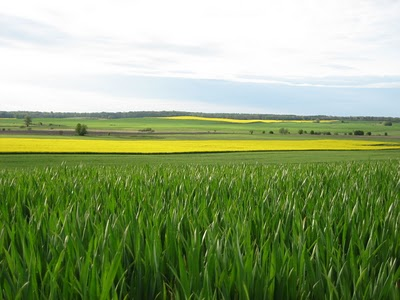 They estimated the German rapeseed crop at 5.43 MMT, down 6% versus 5.76 MMT last year. Sterling rose to it's best levels against the US dollar since August 2009 today, and hit it's highest trade weighted index against a basket of global currencies since late 2008, on the notion that UK interest rates will start to move up again late this year or in the early part of 2015. With the UK looking likely to be returning to a "normal" wheat production year in 2014/15, a strong pound will not be an aid to export ambitions in the season ahead. 16/04/14 -- Soycomplex: Beans closed sharply higher for the third session in a row. Fund buying continues to support the market, they were in for an estimated net 5,000 bean contracts on the day today. Old crop remains extremely tight, with any shorts in May or July getting squeezed out as making delivery against those shorts isn't an easy option. The Buenos Aires Grain Exchange said that the rain-delayed soybean harvest in Argentina is 21.4% complete, up from 14% a week previously, producing a crop of around 13.5 MMT so far. The harvest this time last year was 38.6% complete. The Brazilian soybean harvest was 86% complete as of last Friday. US weekly export sales are out tomorrow, with the trade expecting zero on old crop beans due to lack of availability, and with sales of maybe 150-350 TMT on new crop. We will also see how many soybeans have been shipped out of the US in the past week, with shipments so far already at 96% of the USDA's forecast for the entire season. Unfulfilled sales to China are said to be only 262,800 MT, with a further 984,000 MT outstanding for unknown. This makes the Chinese credit/default problems much more of an issue for South American sellers than it is for the US. Two vessels are currently said to be in Brazil's shipping line-up to load beans for the US. It looks like more will be needed. 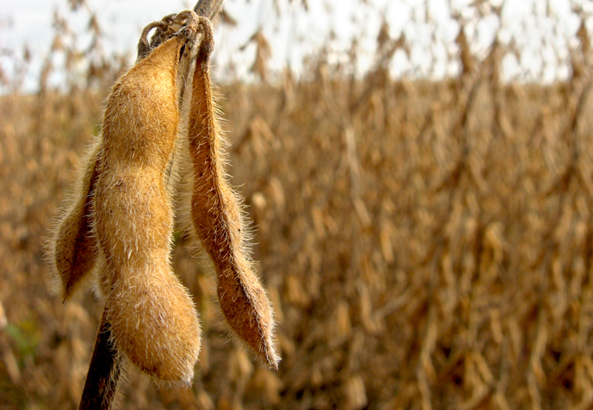 May 14 Soybeans closed at $15.18 3/4, up 17 1/2 cents; Jul 14 Soybeans closed at $15.08 3/4, up 21 1/4 cents; May 14 Soybean Meal closed at $491.00, up $3.60; May 14 Soybean Oil closed at 43.71, up 88 points. Corn: The corn market closed around 4 to 6 cents lower. Funds were estimated to be net sellers of around 6,000 lots on the day. The Chinese Stats Bureau said that corn plantings there this year will rise 1.75%. Dr Cordonnier said that 7% of Mato Grosso's safrinha corn crop has already finished pollinating, with 10% of the crop at the same stage in Parana (Brazil). Crop conditions so far are "very favourable" he noted. Parana corn is rated 93% good, 6% average and only 1% poor, he said. CONAB estimate second crop corn producing 43.9 MMT this year, or around 58% of the national crop. UkrAgroConsult said Ukraine exported 954,000 MT of grain between April 1-April 14. The vast majority of that will have been corn. The Ukraine Ministry said that the country had exported 28.6 MMT of grains to date this season, and over 18 MMT of that has been corn. The Buenos Aires Grain Exchange said that progress with Argentina's corn harvest has been very slow, with only 19.7% of the crop cut so far. That's only 3.2% up in a week, and 12 points down on a year ago at this time. They noted that there had been an early frost in some parts of the grain belt, and that this could have an adverse affect on yields. Nevertheless, they held their production estimate unchanged for now at 24 MMT. Weekly US ethanol production came in at 939k barrels/day, up sharply on 896k barrels/day a week previously, and hitting the level required to match USDA targets for the season for the first time in weeks. This was the highest weekly grind since early December. May 14 Corn closed at $4.97 1/2, down 6 1/4 cents; Jul 14 Corn closed at $5.03 1/2, down 6 1/4 cents. Wheat: The wheat market closed lower on profit-taking. Fickle funds were given credit for ending the day net sellers of around 4,000 Chicago wheat contracts on the day - having been said to have been net buyers of 6,000 yesterday. The latest US weather forecast on the Plains is warmer, and a bit wetter. Recent Chinese government wheat auctions haven't been going well. They only sold less than 17% of the 626 TMT of wheat on offer in today's sale and last week's auction of 858 TMT of wheat only received a take-up rate of 16%. Jordan purchased 150,000 MT of optional origin wheat yesterday and 100,000 MT of optional origin barley today. The Black Sea is the most likely origin for both. EU soft wheat exports look like they are finally slowing, with Brussels granting 421 TMT worth of export licences this week versus 585 TMT the previous week. 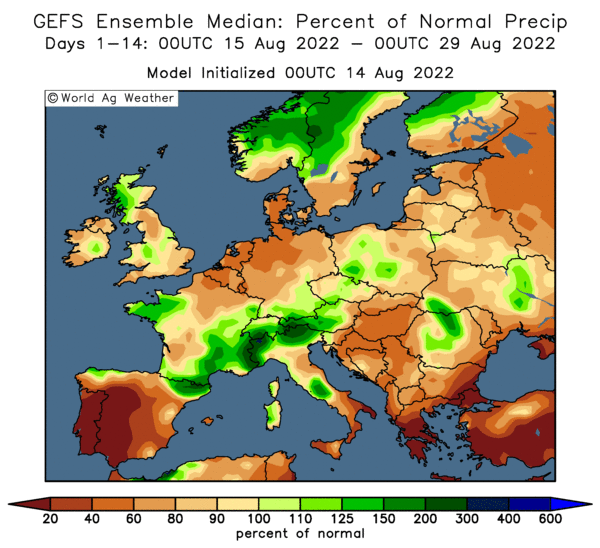 The 2014 EU wheat and barley harvests look like being early, with crops running 2-4 weeks ahead of normal maturity following a generally mild winter. Japan is tendering for 136,200 MT of food grade wheat. 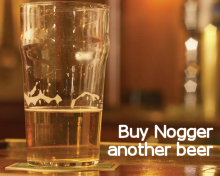 There's a long weekend looming, with US and Europe closed on Friday. US markets re-open on Monday afternoon, whilst Europe remains shut until Tuesday. Who knows what the Ukraine situation will be like by then? Trade estimates for tomorrow's weekly export sales report from the USDA are all over the place, from as low as only 250 TMT to as high as 850 TMT. May 14 CBOT Wheat closed at $6.88, down 13 3/4 cents; May 14 KCBT Wheat closed at $7.54 1/2, down 11 cents; May 14 MGEX Wheat closed at $7.26 1/2, down 12 cents. 16/04/14 -- EU grains closed mixed with May 14 London wheat up GBP0.85/tonne to GBP170.25/tonne, and with new crop Nov 14 London wheat closing GBP0.20/tonne weaker at GBP159.85/tonne. May 14 Paris wheat closed EUR2.75/tonne lower at EUR218.50/tonne, Jun 14 Paris corn was up EUR0.25/tonne at EUR189.50/tonne, whilst May 14 Paris rapeseed rose EUR4.25/tonne to close at EUR424.00/tonne. Paris wheat fell from yesterday's 11-month high on consolidation/profit-taking, whilst old crop London wheat continues to firm on tight availability. Customs data showed that UK wheat imports fell to only 82 TMT in February, down 68% versus 12 months previously, and the smallest monthly volume since June 2012. That takes UK wheat imports for the season so far to 1.55 MMT versus 1.87 MMT this time a year ago. The data also shows that February UK corn imports were 172.5 TMT, taking the 2013/14 marketing year to date import total to 1.61 MMT, up 45% versus 1.11 MMT at the same point in 2012/13. The German Farmers Co-operative raised their forecast for the 2014 wheat crop there by 100 TMT from last month to 24.74 MMT, although that's still a 1% fall on last year's production. They trimmed slightly their 2014 rapeseed production forecast from 5.57 MMT to 5.54 MMT, a 3.9% decline versus 2013. "Plants are in an overall good condition," they said, noting that recent rain has alleviated some winter dryness concerns. EU wheat exports are finally showing signs of slowing down a little. Brussels granted 412 TMT worth of soft wheat export licences this past week, down from 585 TMT a week previously and 596 TMT the week prior to that. Corn import licences meanwhile outstripped those for wheat imports at 497 TMT this past week, up from 347 TMT a week previously and versus 391 TMT for the previous week. Total EU soft wheat exports for the marketing year to date now stand at a record 24.3 MMT, up 49% versus a year ago. Corn imports are at 11.3 MMT, a 23% rise on last season. Jordan bought 100 TMT of optional origin feed barley in a tender for Jun/Jul shipment. 15/04/14 -- Soycomplex: Beans closed above $15/bu on a front month for the first time since last July after the March NOPA crush came in well above expectations. The trade was anticipating a crush number of around 146 million bushels. What it got was a figure of 153.84 billion, which under current "excited" market conditions was enough to spark another feeding frenzy amongst the fund community, who ended up as net buyers of an estimated 10-12,000 soybean contracts on the day. The crush number again implies that US 2013/14 soybean ending stocks are likely to be far tighter than the USDA currently project. Certainly though this will stimulate imports, and encourage US farmers to not waiver from their intention to plant a record large crop this year. The market views potential demand reductions out of China as more of a problem for South American beans than it is for US beans. There are some suggestions that Chinese buyers could ultimately default on 30 or more cargoes of existing soybean purchases due to negative crush margins and difficulties in obtaining Letters of Credit. The Philippines bought 120,000 MT of US or South American soymeal for Aug/Sep shipment today. Dr Cordonnier estimated the 2013/14 Brazilian soybean crop at 86.5 MMT, unchanged from his previous estimate. He estimated the 2013/14 Argentine bean crop at 53.5 MMT, down from a previous estimate of 54.0 MMT. May 14 Soybeans closed at $15.01 1/2, up 25 1/4 cents; Jul 14 Soybeans closed at $14.87 1/4, up 23 3/4 cents; May 14 Soybean Meal closed at $487.40, up $8.30; May 14 Soybean Oil closed at 42.76, up 50 points. Corn: The corn market ended narrowly mixed on a general lack of news. The Ukraine situation continues to add a bit of support to the market, with corn planting there only just getting going. There's the probability that lack of credit will mean Ukraine growers are forced to cut back on their planting intentions and also on inputs. Agritel yesterday estimated Ukraine’s 2014 corn crop at 23.3 MMT versus a previous estimate of 26.8 MMT, and down 18% from a year ago. Remember though that this will still be their second largest corn crop in history. Dr Cordonnier estimated the 2013/14 Brazilian corn crop at 70.0 MMT, unchanged from previous estimate, although he did note that there was potential for this the be raised at some time in the future. 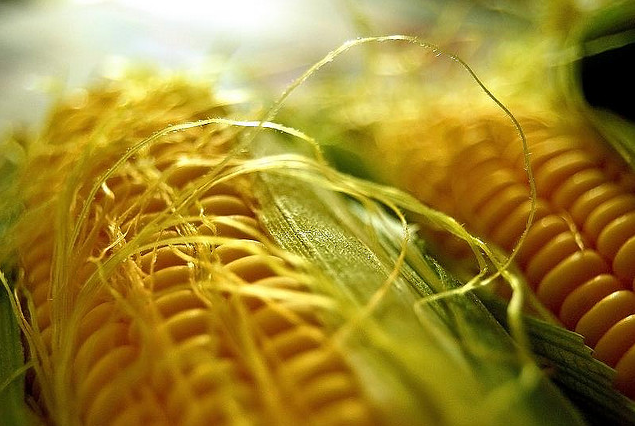 Growing conditions for Brazil's second corn crop are said to be favourable. He estimated the 2013/14 Argentine corn crop at 23.5 MMT, also unchanged from his previous estimate. The Ukraine state stats service said that the country's April 1st grain stocks were 12.3 MMT, up 14% from a year ago. The US Energy Dept will release their usual weekly ethanol production and stocks report tomorrow. Last week's production of 896k barrels/day was well below the circa 938k barrels/day required to hit the USDA's target for the season. Planting of US corn in the Midwest remains delayed by cold weather, although it's too early to suggest that this will mean a drop in yields later this year. May 14 Corn closed at $5.03 3/4, up 3/4 cent; Jul 14 Corn closed at $5.09 1/2, up 1/4 cent. Wheat: The wheat market jumped back above the $7/bu mark in Chicago on heavy spec buying as the problems in Ukraine intensified. Funds were estimated as finishing up as net buyers of around 6,000 Chicago wheat contracts on the day. This would almost certainly take their long holding back above the levels of a fortnight ago, which was their largest net long in CBOT wheat since Nov 2012. Talk of crop damage to US winter wheat after a hard freeze overnight also got the market excited, although some analysts said that less than 1% of the crop was likely to be at risk. "For wheat that was very advanced with jointing there would be serious damage. However, due to persistently cold weather this spring, freeze damage is not likely to be severe in Kansas, where crop development is significantly delayed," said Martell Crop Projections. "Oklahoma wheat jointing was further advanced with 4% of wheat flowering-heading. A hard freeze would have killed pollen leading to a blank grain head with no kernels. 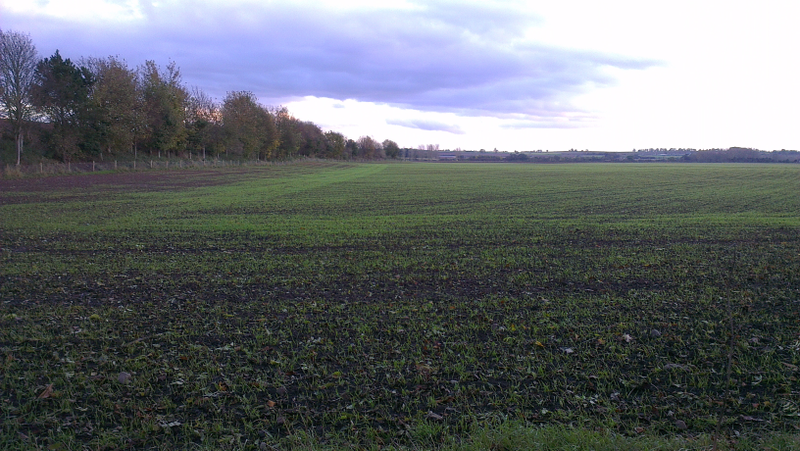 Just a small percentage of the crop would have been affected. Texas wheat was 28% heading suggesting serious freeze damage in wheat. However, we don’t know exactly where wheat was heading. The panhandle is the main wheat region in Texas and also the coldest with mid-upper 20s F overnight. North Central Texas wheat growing areas were less cold with 32 F (freezing) at the minimum. There leaf burn may have developed but no lasting freeze damage. Temperatures tonight are expected to remain above freezing, though mid 30s F are still possible in western Kansas on the High Plains. Moderating temperatures are predicted the balance of the week," they added. May 14 CBOT Wheat closed at $7.01 1/2, up 22 3/4 cents; May 14 KCBT Wheat closed at $7.65 3/4, up 23 3/4 cents; May 14 MGEX Wheat closed at $7.38 1/2, up 21 1/4 cents. 15/04/14 -- EU grains closed generally firmer, with. May 14 London ending GBP0.15/tonne higher at GBP169.40/tonne, and new crop Nov 14 finishing the day GBP1.30/tonne higher at GBP160.05/tonne. May 14 Paris wheat closed up EUR7.25/tonne at EUR221.25/tonne, Jun 14 Paris corn was up EUR0.25/tonne to EUR189.25/tonne and May 14 Paris rapeseed was EUR3.25/tonne higher at EUR419.75/tonne. This was the highest close for a front month on Paris wheat since last May. Once again fresh fundamental news was relatively lacking, the recent rally seems to be mostly about speculative money moving into grains on the back of the Ukraine situation. One report I read yesterday also suggested that "fund managers believe that the weather problems in 3 out of the past 4 years will again surface this summer and no one wants to miss it." How things have changed, 2013 ended with fund money staging their longest unbroken exodus from the grains market, and now they are piling back into it. Chicago fund corn positions "went from short 50k just a couple of months ago to long 250k currently on not much news and corn rallied $1.00. Just think what will happen if we get a normal weather pattern. Funds could actually flip their corn position," one analyst observed. Current spring grain plantings in the FSU are well advanced versus a year ago. Russia is planted on 2.1 million ha (6.4% of plan) versus 1.9 million this time last year. Belarus is done on 900k ha compared to only 6.5k ha this time in 2013. Late last week the Ukraine Ministry said that they were almost done planting early spring grains (excluding corn etc). APK Inform left their estimate for grain production in Ukraine unchanged at 57.3 MMT, despite a "worsening political situation", although that's still a 9% decrease on last year's record. They have winter grain output at 21.8 MMT versus 25.4 MMT last year, and the spring crop at 35.5 MMT compared to 37.7 MMT last year. The Ukraine Ministry said that the country had exported almost 28.5 MMT of grains so far this season, up 35% on a year ago, including 8 MMT of wheat, 2.15 MMT or barley and over 18 MMT of corn. Egypt said that they have enough wheat bought to last them through to Jun 19. Jordan bought 150 TMT of wheat for Jul/Aug shipment. Although the origin is optional, the wheat is most likely to come from the Black Sea, with one of the two sellers being Romanian. The bulls would like to say that the recent rally is only returning the market to "more realistic" levels. Buyers would argue that but for the intervention of Big Bad Vlad we'd now be below £150/tonne on new crop London wheat. Which viewpoint ultimately proves to be correct only time will tell. Certainly predicting where we will be as regards to Ukraine is concerned a few months from now is a very difficult one to call. It should be remembered though that this is a spec-led rally that has little to do with current fundamentals of supply and demand. A sudden piece of unexpectedly bad news, China maybe the most likely culprit to supply it, could spark another mass exodus from the recently built large spec longs that fund money now holds in wheat, corn and soybeans. 14/04/14 -- Soycomplex: Beans ended up recovering most of Friday's losses as fund money returned to the fray after weekend events in Ukraine took a turn for the worst. They were estimated as ending up as net buyers in beans of around 4-5,000 contracts on the day. Weekly US export inspections were reported at 267,939 MT, which is not much better than half of last week's 509,627 MT. Nevertheless, nor do they need to be, cumulative shipments for the marketing year to date now stand at almost 41 MMT, just 2 MMT shy of the USDA's target for the season. US exports are (finally) dropping off as the Brazilian harvest winds down. Safras e Mercado said as of Friday that was 86% complete versus 80% a week ago, 82% a year ago and 78% for the 5-year average. There's unconfirmed talk of more unwanted Chinese purchases of Brazilian beans being resold into the US. The NOPA March crush report comes out tomorrow, with the trade expecting a domestic demand number of around 146 million bushels. There are reports of bird flu outbreak in Japan. Goldman Sachs forecast US soybean prices at $10.50/bushel 12 months from now. 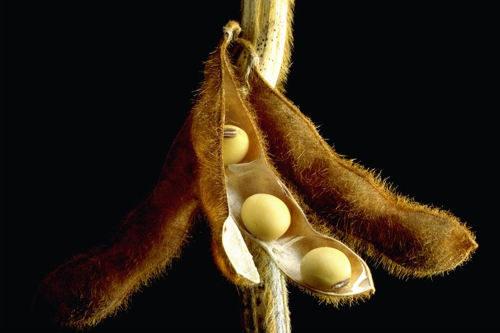 May 14 Soybeans closed at $14.76 1/4, up 13 1/4 cents; Jul 14 Soybeans closed at $14.63 1/2, up 16 1/4 cents; May 14 Soybean Meal closed at $479.10, up $6.20; May 14 Soybean Oil closed at 42.26, up 16 points. Corn: The market closed around 4-5 cents higher, with renewed tensions between Russia and the West/Ukraine supporting. Fund money was estimated as finishing the day as a net buyer of around 5-7,000 corn contracts. The rapid demise of the Ukraine currency, which is down by more than 50% in the past 3 months since their political problems escalated to new heights, is seen harming corn planting and inputs this year. Agritel estimated Ukraine’s 2014 corn crop at 23.3 MMT versus a previous estimate of 26.8 MMT, and down 18% from a year ago. Although for now, Ukraine's corn exports continue relatively uninterrupted, there's also the suggestion that farmers there may hold off selling whatever old crop they have left (and likely do the same on new crop) as a hedge against the weakening hrynia - at least until the situation stabilises. Agritel estimated Russia’s 2014 corn crop at 9.8 MMT versus a previous estimate of 10.2 MMT, and down 6% from 2013. Weekly US export inspections were strong at 1.45 MMT, and now total almost 25.2 MMT for the marketing year to date. Safras e Mercado said that as of Friday 74% of the Brazilian summer corn crop has been harvested versus 63% a year ago. They estimated Brazil’s 2nd "safrinha" corn crop at 40 MMT or more. Current conditions for that are favourable. The USDA released the first crop progress report of the year today, placing the US crop at 3% planted versus 2% this time a year ago and 6% on average. May 14 Corn closed at $5.03, up 4 1/2 cents; Jul 14 Corn closed at $5.09 1/4, up 4 3/4 cents. Wheat: The market closed with good gains, although it also finished well off the intra-day highs as a bit of profit-taking kicked in later in the day. Fund money was estimated as being a net buyer of around 6-7,000 Chicago wheat contracts on the day, smelling blood (unfortunately, literally) on weekend developments in Ukraine. Agritel suggested that financial problems will cut Ukraine many farmers' ability to fund inputs for corn and wheat this year. 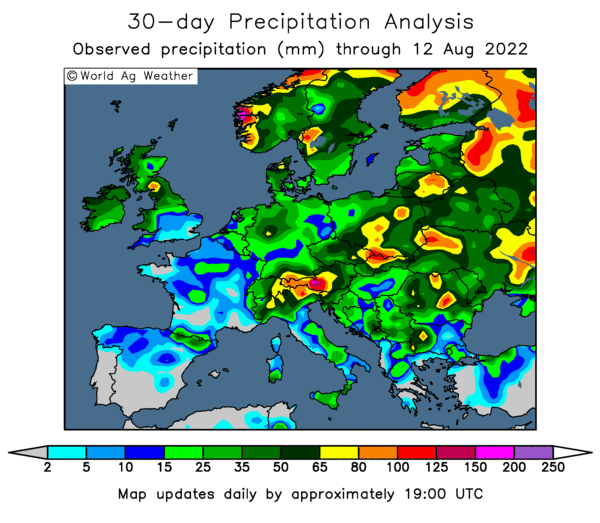 There's also the issue of inadequate winter rains in not just Ukraine, but also Russia. Agritel estimated Ukraine’s 2014 wheat crop at 18.4 MMT versus a previous estimate of 20.0 MMT, and down 16.5% from a year ago. They now see Russia's crop at 48.1 MMT versus a previous estimate of 49.9 MMT, and down 8% from 2013. Taiwan bought 92,550 MT of US milling wheat for May June shipment, according to Reuters. South Korea's NOFI bought 65,000 MT of optional origin feed wheat for Sep/Oct shipment. Weekly US export inspections of 683,544 MT were better than trade expectations of 450-550,000 MT. The USDA reported US winter wheat at 34% good to excellent, down a point from a week ago and versus 36% a year ago. They rated 32% of the crop as poor to very poor, versus 29% a week ago and 31% a year ago. Headed was 5% versus 4% a year ago. Spring wheat plantings were 6% complete versus 5% a year ago. All in all then, the US wheat crop is in similar shape to 12 months ago. May 14 CBOT Wheat closed at $6.78 3/4, up 18 1/2 cents,; May 14 KCBT Wheat closed at $7.42, up 22 1/2 cents; May 14 MGEX Wheat closed at $7.17 1/4, up 15 1/2 cents. 14/04/14 -- EU grains finished mostly higher as tensions in Ukraine escalated to new heights over the weekend. The arrival of a 7 am (London time) deadline for pro-Russian activists to vacate official premises seized in the east of the country over the weekend, or face military eviction, came and went. Moscow denied that Russian agents were provoking civil unrest in the area, and repeated the same lines about "protecting the lives of it's citizens" that were used to justify the annexation of Crimea. May 14 London wheat closed GBP2.25/tonne firmer at GBP169.25/tonne, and with new crop Nov 14 London wheat up GBP3.50/tonne at GBP158.55/tonne. May 14 Paris wheat closed EUR4.25/tonne higher at EUR214.00/tonne, Jun 14 Paris corn was up EUR2.00/tonne at EUR189.00/tonne and May 14 Paris rapeseed fell EUR0/50/tonne to EUR416.50/tonne. The news out of Ukraine overshadowed everything else, not that there was that much of anything else fresh today, and US wheat futures shot higher in early trade with EU grains following suit and staying there. This is again all about speculation, whilst for now at least exports out of Ukraine continue more or less unhindered. It is also interesting to see wheat as the main beneficiary (just as it was when the invasion of Crimea began), when corn is possibly more at risk from production losses due to reduced plantings/input cut-backs than wheat. APK Inform reported that Ukraine's seaports had shipped out almost 550 TMT of grains last week, although down on 619 TMT the week before, that's still a respectable volume. That total included 462.6 TMT of corn and 84.3 TMT of wheat. Year to date Ukraine exports are now at 28.338 MMT, versus just over 20 MMT this time a year ago. That includes almost 18 MMT of corn and nearly 8 MMT of wheat. Full season Ukraine exports are currently expected to be around 33 MMT. Russia's grain exports meanwhile totalled 641 TMT in the Apr 1-9 period, most of which (549 TMT) was wheat. Year to date exports are now just under 21.5 MMT, a 47.5% increase on last season, including nearly 16 MMT of wheat, over 3 MMT of corn and over 2 MMT of barley. Closer to home, the EU Commission's MARS unit forecast 2014 EU soft wheat yields at 5.58 MT/ha, down 1.6% on last year, but 2.7% above the 5-year average. Barley yields were estimated at 4.49 MT/ha, down 4.9% on last year, but up 2.7% on the 5-year average. 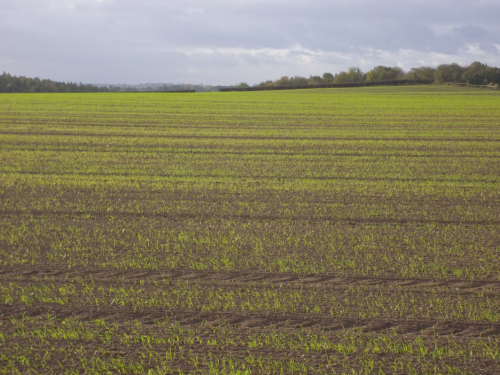 OSR yields were seen at 3.05 MT/ha, up 1.3% versus 2013 and 2.7% above the 5-year average. On a UK specific level they forecast wheat yields here at 7.74 MT/ha, up 4.9% versus 2013. Barley yields were estimated at 5.69 MT/ha, down 2.7%, and rapeseed yields at 3.41 MT/ha, up 18.3%. 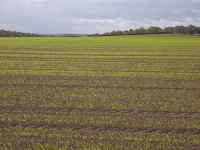 "In eastern France and England, the crops’ demand for water is still being met by soil water reserves, which were replenished at the beginning of the winter season. However, top-soils are drying out, and the spring crops sowing/ emergence will be negatively impacted if the precipitation deficit continues," they said. In Germany, "March was one of the warmest and driest in our historical time series. Crop development is advanced with good leaf area expansion, but rain is now needed to sustain crop growth in the coming weeks," they added. 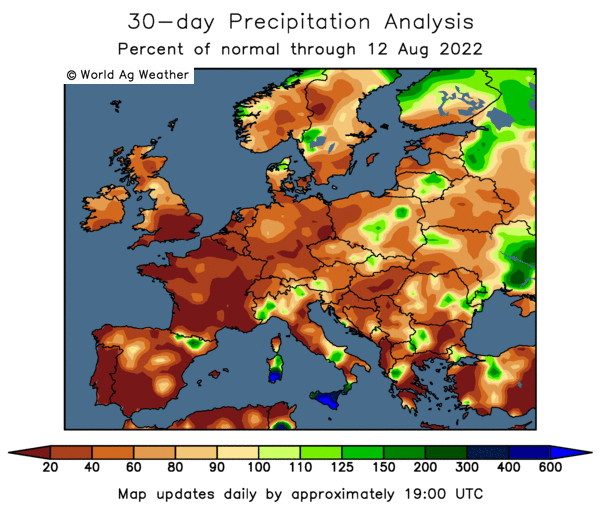 In Ukraine, "the exceptionally dry conditions in central Ukraine may affect yields of winter cereals. Winter wheat yields forecasts are below the 5-year average," they noted. 11/04/14 -- Soycomplex: Beans closed sharply lower on profit-taking and fund selling (estimated at a net 4,000 in soybeans on the day) spurred by widespread reports of Chinese defaults and cancellations/deferrals of Brazilian soybean purchases. Chinese demand is after all almost single handedly responsible for keeping the global soybean market going. It is also the reason why US growers are expected to "go large" and plant a record soybean crop this year. MDA CropCast yesterday estimated US 2014 production at 97.2 MMT, a 12% hike on last year. Brazilian growers are of course also keen to continue to get a slice of the action. Their crop will rise 9% to 95.7 MMT in 2014/15, as world output increases by 7.5% to a record 292.1 MMT, MDA CropCast said. Note too, that they are often quite restrained in their production estimates. The USDA will give us their first 2014/15 crop production forecasts next month. As well as Chinese defaults/cancellations there are also now reports circulating that the Chinese government may start selling beans from its reserves in May. A cynic would say "they're just trying to get the market down" but it doesn't feel like that to me on this occasion. The Argentine Ag Ministry said that farmers there have currently sold 18% of their new crop soybeans versus 24% a year ago. The Buenos Aires Grains Exchange said that the Argentine harvest is 14% complete versus 9.5% a week ago and 24% a year ago. They estimated the crop at 54.5 MMT, unchanged from their previous estimate. MDA CropCast raised their forecast for the Brazilian 2013/14 soybean crop by 1.2 MMT to 87.6 MMT. That's now very similar to Lanworth and the USDA who both line up at 87.5 MMT, and above CONAB who gave us 86.08 MMT yesterday. The USDA announced 330,000 MT of US beans sold to unknown for 2014/15 shipment. The March NOPA crush report comes out on Tuesday, with the trade expecting a figure of around 146 million bushels, which would be the largest March crush in 4 years. May 14 Soybeans closed at $14.63, down 19 1/4 cents; Jul 14 Soybeans closed at $14.47 1/4, down 18 1/4 cents; May 14 Soybean Meal closed at $472.90, down $6.60; May 14 Soybean Oil closed at 42.10, down 40 points. For the week that still puts front month beans higher, up 26 1/2 cents, with meal $4.50 firmer and oil up 162 points. Corn: The corn market closed around 2-5 cents lower, but like beans it still managed net gains for the week. Chinese demand, or lack of it is also an issue for corn, and US corn in particular as the dispute over the MIR 162 variety trundles on. Some suggest that this issue may not now be resolved until the second half of the year. China are said to have now rejected 1.45 MMT of US corn and US corn products since this spat began last November. The National Grain and Feed Association said that exports of US corn and corn products to China between January and April are down 85% versus the same period last year. The Argentine Ag Min said farmers there have sold 22% of their new crop corn versus 55% a year ago. The Buenos Aires Grains Exchange said that the Argentine corn harvest is 16.5% complete versus 13% a week ago and 28.2% a year ago. They estimated production at 24.0 MMT, unchanged from their previous estimate. Lanworth estimated the Brazilian 2013/14 corn crop at 71.0 MMT versus a USDA estimate of 72.0 MMT. MDA CropCast raised their forecast for Brazilian production to 71 MMT citing favourable conditions for 2nd crop corn. They forecast the US 2014/15 corn crop at 357 MMT, which is up 9.3 MMT on last year despite a lower planted area due to an anticipated rise in yields. A brief warm up this weekend will give way to much colder Midwest weather next week with heavy rain on the way, said Martell Crop Projections. The rain should be welcome, although the return to cold will not. "Moderating temperatures in April generated more optimism for corn planting in the Midwest. April temperatures to date have been near normal, promoting gradual thawing of frozen fields. Frost is still present in farm fields, however, especially the Upper Midwest. Southern Minnesota's topsoil temperatures are still 37-40 F, a far cry from the 50 F needed to germinate seeds. January-March temperatures were among the coldest on record causing deep penetrating frost in Midwest corn farms. Yet, deep frost that delays planting is not necessarily a prescription for a reduced corn yield. Similar cold occurred in 1978 and 1979 abut in both years the corn yield finished better than average," they observed. The USDA are expected to release their first national corn planting progress report on Monday night. On a national level around 3-5% of the corn crop is expected to have been sown in southern states. May 14 Corn closed at $4.98 1/2, down 2 3/4 cents; Jul 14 Corn closed at $5.04 1/2, down 2 3/4 cents. May 14 corn posted a 6 1/2 cent gain for the week. Wheat: The wheat market closed mostly lower on the day, and lower for the week, across the three exchanges. Egypt bought Romanian, Ukraine and Russian wheat in their tender. US and French wheat proved too expensive. Algeria bought what was considered to most likely be French wheat. Grain exports continue out of the Black Sea unabated. However, tensions between Ukraine (and the West) and Russia continue, with reports of pro-Russian groups seizing control of police buildings n some cities in eastern Ukraine, and reports of ensuing gun battles breaking out as Ukraine forces try to regain control, emerged over the weekend. The Russian taking of Crimea was of course one of the primary catalysts responsible for fund/spec money coming flooding back into the grains markets, sending Chicago wheat prices surging by almost 30% in 6 weeks from the beginning of February through to mid-March. We shall have to see how these latest developments pan out, and whether this encourages more spec money to re-enter the market. The latest Commitment of Traders report shows managed money reducing their net long holding in wheat, corn and soybeans for the week through to Tuesday night, although not by that much. In the case of wheat, they cut their net long by less than 2k contracts to 43k. Last week's position was said to be their largest spec long holding in CBOT wheat since November 2012. Their net corn long was reduced by under 6k lots this week to 270k and their long in beans reduced by just over 12k to 181k contracts. Talk of 2014 developing into an El Nino year would probably come too late to be of much benefit to US winter wheat on the Plains. El Nino, if it occurs, would usually be positive for Midwest crops as it typically brings wetter and cooler summer growing conditions, said Martell Crop Projections. That would probably be beneficial for spring wheat and also of course US corn and soybean production. The USDA attaché in Turkey forecast the 2014 wheat crop there to fall from 18.0 MMT last year to 15.8 MMT this time round on drought. The Turkish 2014 barley crop was estimated falling from 7.3 MMT to 5.8 MMT and the corn crop dropping from 5.1 MMT to 4.9 MMT. CONAB yesterday pegged Brazil's 2014/15 wheat production at 6.7 MMT, which is a 1.2 MMT increase from last year. Beneficial rains are expected there over the weekend. May 14 CBOT Wheat closed at $6.60 1/4, down 2 cents; May 14 KCBT Wheat closed at $7.19 1/2, down 3 cents; May 14 MGEX Wheat closed at $7.01 3/4, up 3/4 cent. For the week Chicago wheat lost 35 1/4 cents, with Kansas down 44 cents and Minneapolis losing 38 cents.